Super Fisol Fish Oil / 90 Softgels - Nature's Way®. Super Fisol™ is a concentrated blend of EPA & DHA giving 70% Omega-3 fatty acids. Super Fisol is a blend of EPA & DHA containing 40% EPA (Eicosapentaenoic Acid) and 30% DHA (Docosahexaenoic Acid). Targeted Release™ Super Fisol’s unique enteric coating ensures the following key benefits not found in uncoated fish oil supplements. Take 1 softgel up to three times daily with water. If taking any medications, consult a healthcare professional before use. How are Fisol and Super Fisol processed to ensure that these products do not contain any harmful contaminants? The Fisol products are purified through a multi-step proprietary process that involves molecular distillation. Molecular distillation is a purification process designed to remove toxic trace elements, such as PCBs. The process removes toxins and heavy metals from the whole oil while preserving the omega-3 fatty acids and other beneficial compounds. When the processing is complete, the fish oil is analyzed to ensure purity. The Fisol products do not contain any harmful levels of contaminants and are tested for PCB's, heavy metals (including mercury) and other impurities. What types of fish are used in Fisol and Super Fisol? 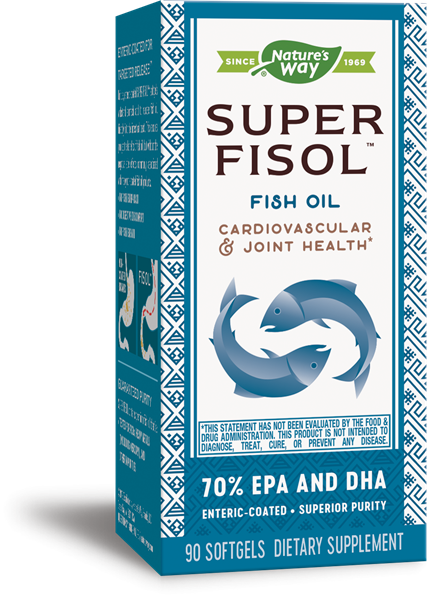 Fisol and Super Fisol contain fish oil made from sustainable sourced Anchovy, Sardine, and Mackerel. These fish are sustainably harvested and 100% traceable, which helps support delicate ocean ecosystems. Premium 50% DHA fish oil in a convenient 1,000 mg softgel.